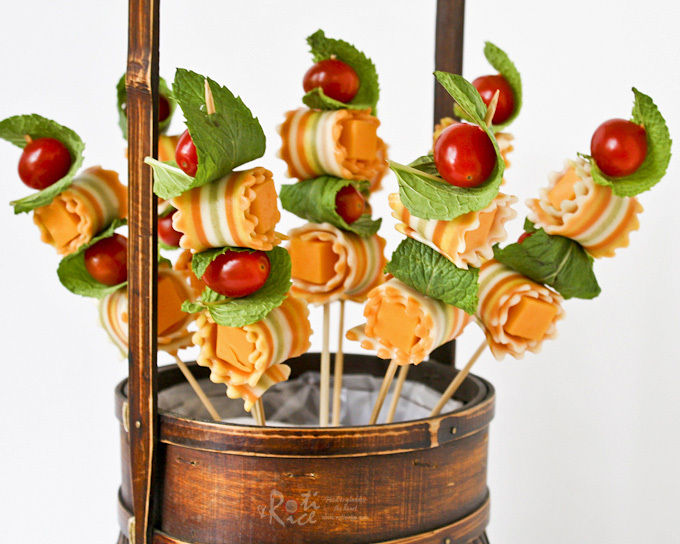 These Antipasti Kabobs are made with colorful striped pasta, cheese, grape tomatoes, and mint leaves. They are a fun and tasty addition to any party table. Food on skewers are the perfect party food. They lend a festive touch to any occasion as they are fun and easy to handle. 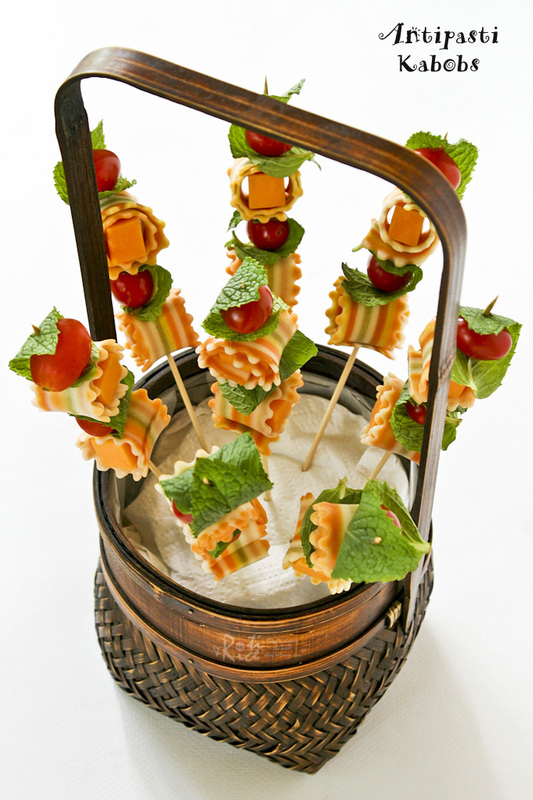 Little morsels of different colors, textures, and tastes can all be threaded together to make an eye-catching display. In fact, an entire meal of appetizer, main course, and dessert can all be put on sticks. Recently, I made an appetizer with Mother-In-Law Tongues Pasta. I only used half the package, leaving me sufficient pasta to create yet another fun dish. This pasta is too pretty to be simply cooked and toss in a sauce. I initially tried to string them up like a curvy ribbon but they broke apart into thin strands. After some thought, I decided to wrap them around a piece of cheese and thread them together with mint wrapped grape tomatoes. The mint leaves give it a fresh taste and a pop of color. Finding a vessel to hold these Antipasti Kabobs was half the fun. This little basket with a tall handle was just the right thing. I filled it up with floral foam and covered it with a piece of napkin. These colorful kabobs stood in there nice and tall. I used aged cheddar cheese for the rollups but you can use any kind of firm cheese you prefer. The grape tomatoes can also be swapped out for other fruits and vegetables. Bring a pot of water to boil. Add some salt. Cook pasta as for 11 to 12 minutes. Drain. Cut each strip of pasta into half. Lay a strip of pasta out onto a board. 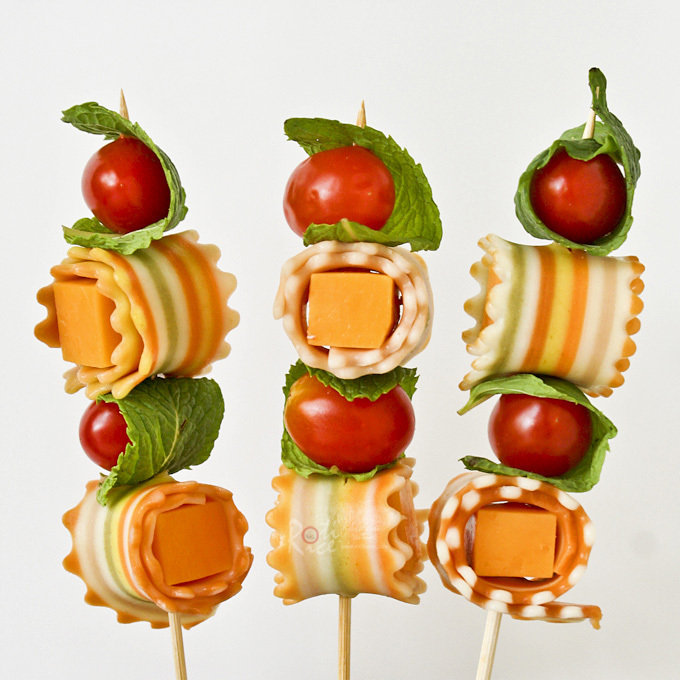 Place a cube of cheese at the edge of the strip and roll pasta tightly around the cheese. Repeat with the rest of pasta and cheese. 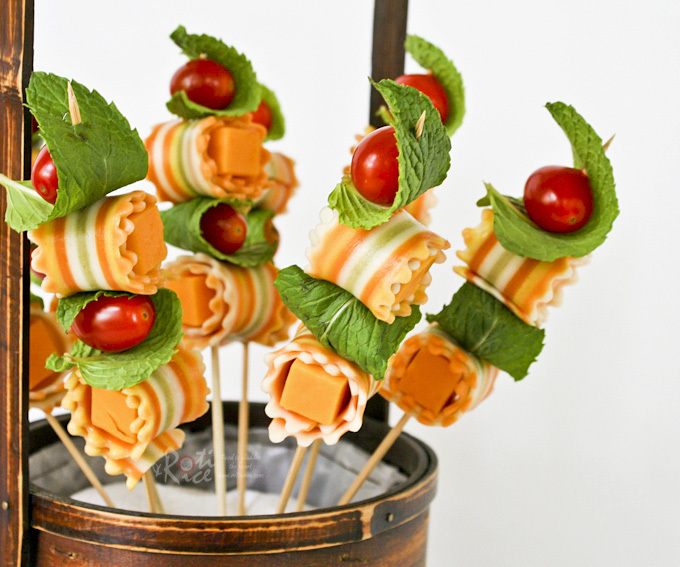 Thread two pasta-cheese rollups onto skewer alternating with two mint wrapped grape tomatoes. Repeat with the rest of the pasta-cheese roll-ups and tomatoes. Cover with plastic wrap and chill for at least 30 minutes before serving. 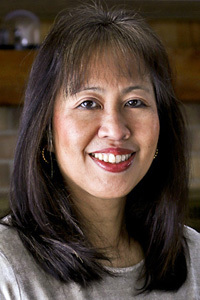 I am linking this to Friday Mint Blog Hop hosted by the lovely Katherine Martinelli. 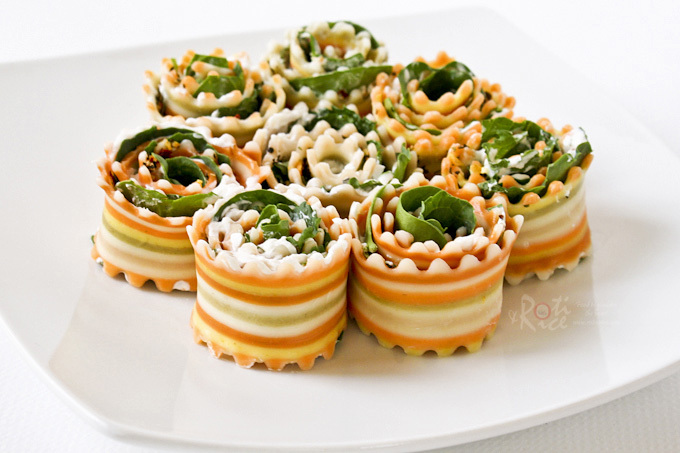 For another fun appetizer using Mother-in-Law Tongues Pasta, check out my Antipasto Rollups. Oh, this is a fun recipe, good for party! WOW!! You’re so creative Biren 🙂 Lovely presentation and too pretty to eat!! 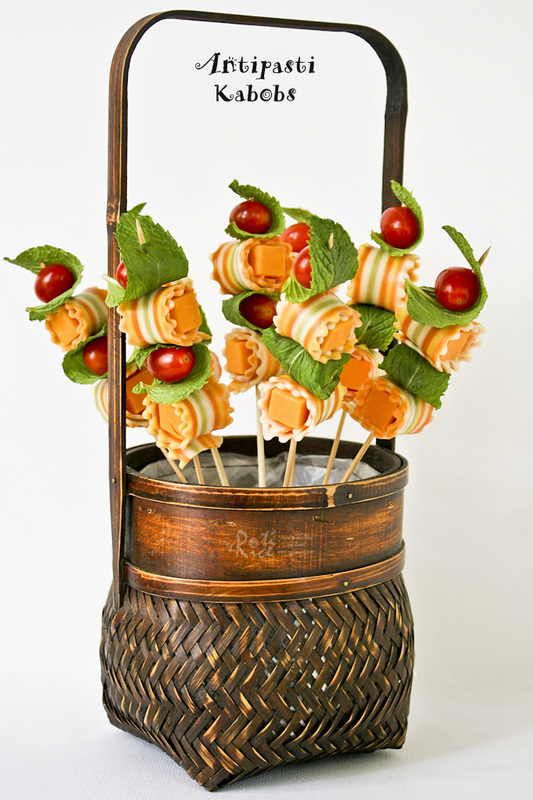 As with your antipasto rollups, these antipasti kabobs are so, so pretty! I just love the combination of colours. They make a nice “bouquet” in your lovely basket 🙂 Definitely great party food idea! Hassle-free, pretty and healthy. Thanks for sharing, Biren! U’re absolutely right, these pastas r simply too pretty to be cooked & toss in sauce. Brilliant, Biren! I’ve never seen this type of pasta before. Love those colours! Well done, dear! I love these skewers and the basket they rode in on! Fabulous Biren. This is very creative of you. Maybe you should start a business doing this, Biren. Nice! You are so creative Biren! I love this idea, it perfect for summer get togethers. Biren, you are to clever! I loved it when you used this pasta before. Funny when you say Mother-in-law’s tongue…it reminds me of all the mother-in-law tongue plants I have growing in my back yard! BTW, I ordered a pandan plant on Ebay from Malaysia. I will let you know when and if I get it! They are too cute to eat! What a fun idea…they are just gorgeous! Wishing you a wonderful and safe weekend! What a great idea! Hope you have a wonderful weekend! That is the prettiest pasta I’ve ever seen, and I love the creativity!! The idea of the antipasta kabobs is genius. Love seeing the Mother-in-Law’s tongue pasta again – so pretty. Good combo of flavors, and I have mint everywhere in my garden that’s looking to be eaten! Biren, you really brighten up the table with this pretty kebobs. This is the 1st time to see this so called Mother in Law tongue pasta !! Have not see it before even in Paris. Biren, glad to be a fan of your as you always surprise us with delicious and pretty dishes and introduce the new ingredients to all you fans . Thanks again !! I love this colorful creative dish. Have been looking for the pasta- Mother- in- laws Tongue. Do you know where I can find it? You may have to buy it on-line. Please click here for the link. These kabobs are so pretty & look tasty too. I am wondering if the pasta ribbons are flavored or do they taste like regular pasta? The different colors in the pasta are naturally colored and so you can say they are flavored but only very subtly. For the most parts, they do taste like regular pasta.